Since 2002, Ben Uri Gallery has been exiled to a small, shop-like building on a quiet street in St John’s Wood, with the vast majority of its collection housed in an inaccessible storage facility in Wiltshire – a miserable fate for what should be a vibrant part of the cultural life of the capital. But with ‘Out of Chaos’ at Somerset House, Ben Uri is celebrating its 100th birthday downtown, offering a rare opportunity to see a substantial selection from the permanent holdings, and looking brightly towards the gallery’s future prospects. The Ben Uri Art Society was set up in 1915 to support Jewish immigrant artists and craftsman, and had an early emphasis on decorative art, beautifully exemplified in ‘Out of Chaos’ by founder Lazar Berson’s mandala-like Circular Design for Ben Uri Art Society (1915). The focus soon expanded, and Ben Uri’s permanent collection includes some distinguished 19th-century oil paintings in the best Victorian and Edwardian modes by the likes of Solomon Hart, Solomon J. Solomon and the Jewish Pre-Raphaelite Simeon Solomon. But the stand-out pieces mostly come from the early 20th century, and particularly from artists associated with the wonderful flowering of the ‘Whitechapel Boys’; in a single room of ‘Out of Chaos’ we find major works by Isaac Rosenberg, David Bomberg and Mark Gertler. 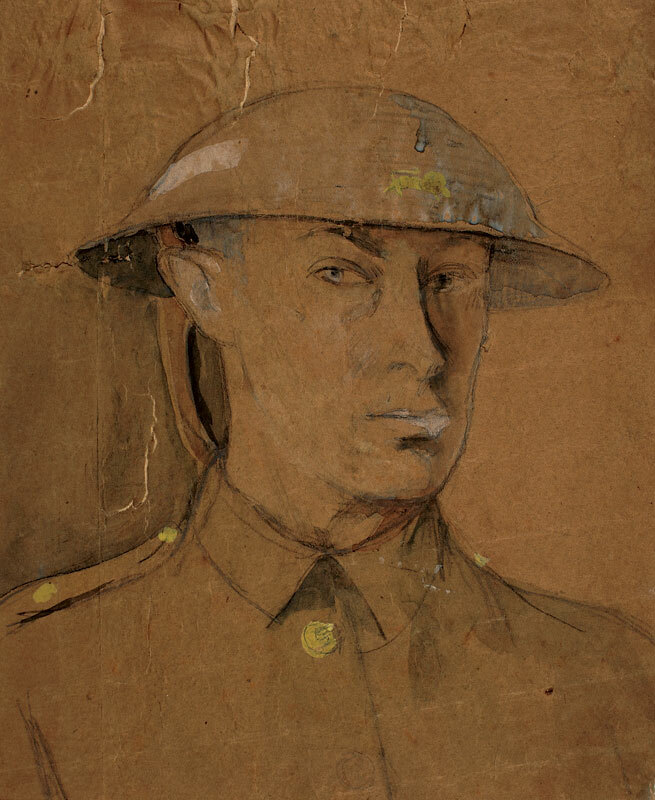 Rosenberg’s heartbreaking Self-portrait in Steel Helmet (1916) shows the great poet and painter’s watchful eyes peering from under the rim of his helmet, in his last completed painting, made in the trenches on cheap brown packing paper, and now blistered and crumbling after 100 years. 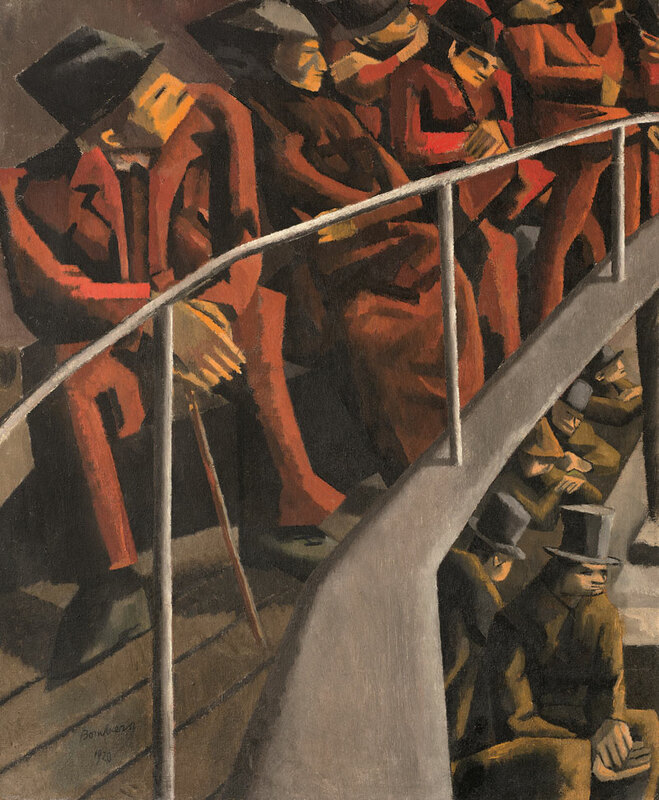 Bomberg’s Ghetto Theatre (1920) – one of Ben Uri’s first acquisitions in 1920 – still startles, dominated by the long swooping curved lines of the theatre railing, which show how much strength and confidence of line Bomberg carried forward to his more figurative work from his more avant-garde work of the mid 1910s. His Racehorses (1913) is a wonderfully rhythmical work from his more Cubist and Futurist-influenced period, when he was in quest for ‘the construction of pure form’, in his own words. And the centrepiece of the exhibition is Mark Gertler’s Merry-Go-Round, on loan from the Tate, which acquired it from Ben Uri in 1984. This is the painting that drew a memorable rhapsody from D. H. Lawrence, whose own sense of modernist form was deeply affected by Gertler’s ‘contemplation of blaze, and violent mechanical rotation and complex involution, and ghastly, utterly mindless human intensity of sensational extremity’. Lytton Strachey more coolly remarked that while he ‘admired’ the painting he could not like it: ‘one might as well think of liking a machine-gun’. In an inspired hang, Gertler’s carousel show-ponies stare down Bomberg’s racehorses from the opposite wall – two different ways of channelling a response to advanced military aggression through animal form, each strongly holding their own in the exhibition. Among many other highlights in ‘Out of Chaos’, several later works point towards the possible future of Ben Uri, by showing Jewish artists addressing subjects associated with other minority or migrant groups: Eva Frankfurther’s delicate and muted oil painting West Indian Waitresses (1955) gives early notice of the multicultural face of postwar Britain; Michael Rothenstein’s screenprint The Shooting of George Wallace (1973) addresses the 1972 assassination attempt on the segregationist Governor of Alabama by juxtaposing a photograph of a young man black, eyes buried in shade and hands cuffed behind his back, with a doubled image of the electric chair; and Rachel Garfield’s video work, You’re Joking, Aren’t You? (2005) narrates the everyday micro-aggressions and instances of racial prejudice faced by black Britons. These works point towards Ben Uri’s reconceived aim of establishing a Museum of Art, Identity and Migration in the heart of London, which will focus not just on Jewish artists but on 10 different migrant communities. The gallery has been badly in need of an appropriate permanent home for many years, with a rather melancholy wall in this exhibition mapping out the 12 different locations Ben Uri has had since 1915, dotted around central and north London, and creeping increasingly northwards since the ’90s. In May this year, Ben Uri lost out to a commercial project for the chance to occupy a 60,000 sq ft space at Tower Bridge. 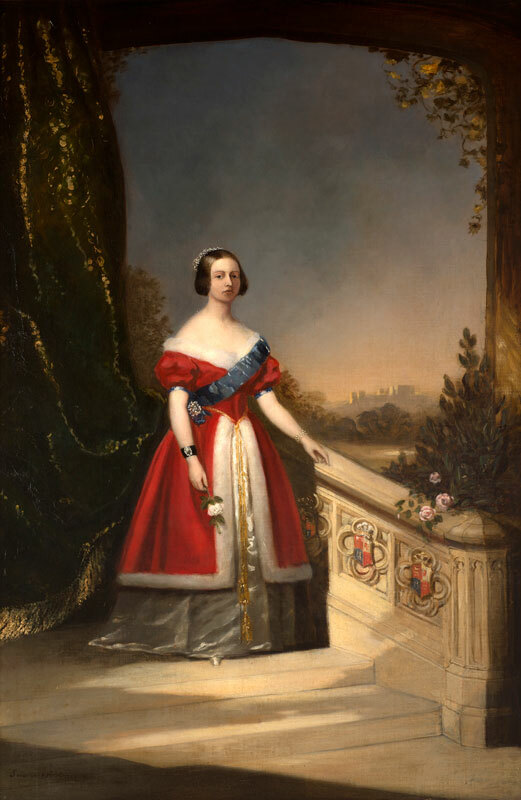 ‘Out of Chaos’ makes clear what a rich and powerful enhancement it would be for British cultural life if the gallery could find the home it deserves. 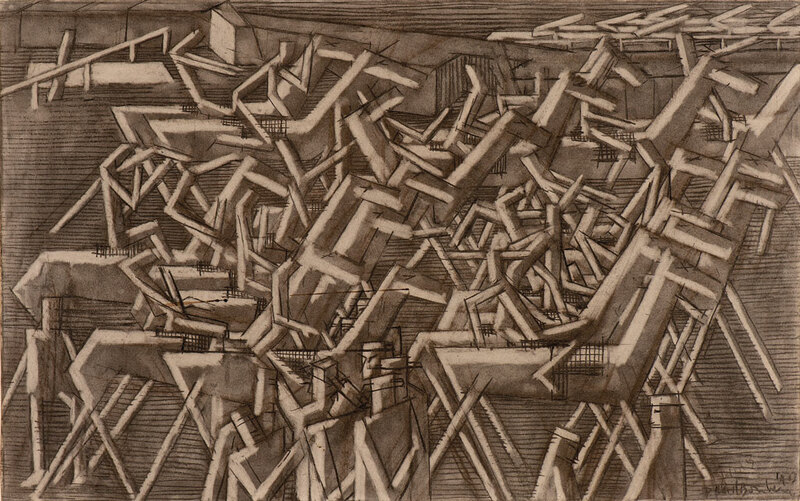 ‘Out of Chaos; Ben Uri: 100 Years in London’ is at Somerset House, London, until 13 December.